One of my more recent discoveries was this gluten free, and as in my adaptation, dairy free crepe the Bene Israel (Sons of Israel) Indian Jewish community made for dinner, Hol HaMoed (holiday mid-week), on Passover. This little gem of information was shared with me by my friend Shayela Cowen, a Bene Israeli now living in Australia. Ms. Cowen didn't have a recipe. A back and forth discussion with her about consistency, texture and ingredients led me into a whirlwind of recipe testings. For the life of me (in hind sight), I can't figure out why the first batch was such an epic failure?! Well, I can think of several reasons, but not to warrant an utter and complete disaster. See top right photo. The so called "crepes" turned out more like pancake pucks. I've done some research and found that there are quick, unfermented Indian rice flour dosa versions. The quick part suited me as the Bene Israeli didn't let any food ferment on Passover and dosa batter is usually fermented overnight. Any leavening is forbidden on Passover to commemorate the Israelites leaving Egypt in haste and having no time to let their bread rise. So I made quick dosa (crepe/pancake) and the batter sizzled beautifully as seen in this video. Like Food Wanderings' page while there. I will be sharing more quick videos on my FB page to show technique, texture and more. But as successful as the quick dosa was for an egg-free, gluten-free and dairy-free "pancake," it felt fraudulent. It wasn't the rice crepe my ancestors made on Passover. 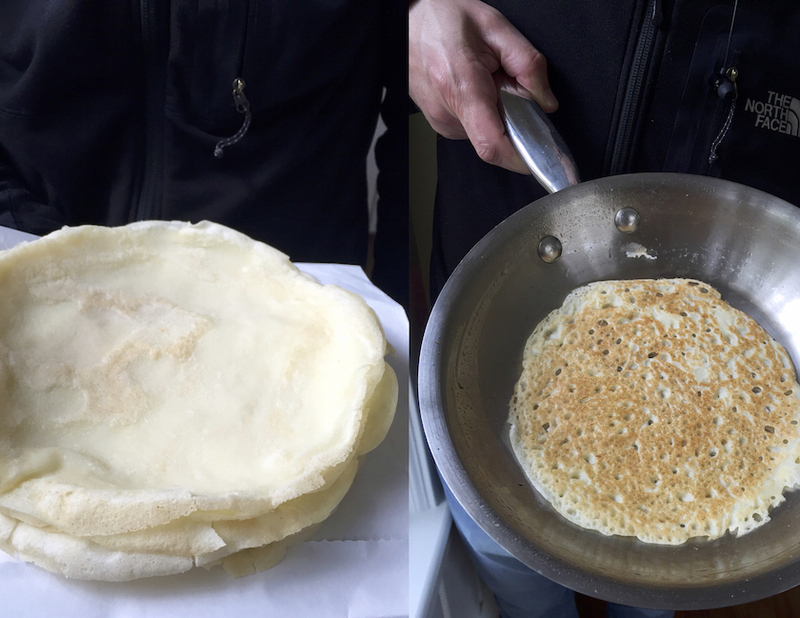 The polis (pancakes), as we call both wheat flour and rice flour crepe versions, should be pretty identical to these all purpose flour crepes I shared during Food Wanderings' infancy. I thought a simple swapping of the rice flour for wheat would do the trick as we can't use wheat flour on Passover. In theory it works, but not so much in practice. Measurement of ingredients wasn't the only factor. The type of skillet was another. How a material conducts heat and at which rate affects the appearance and consistency of the pancake. 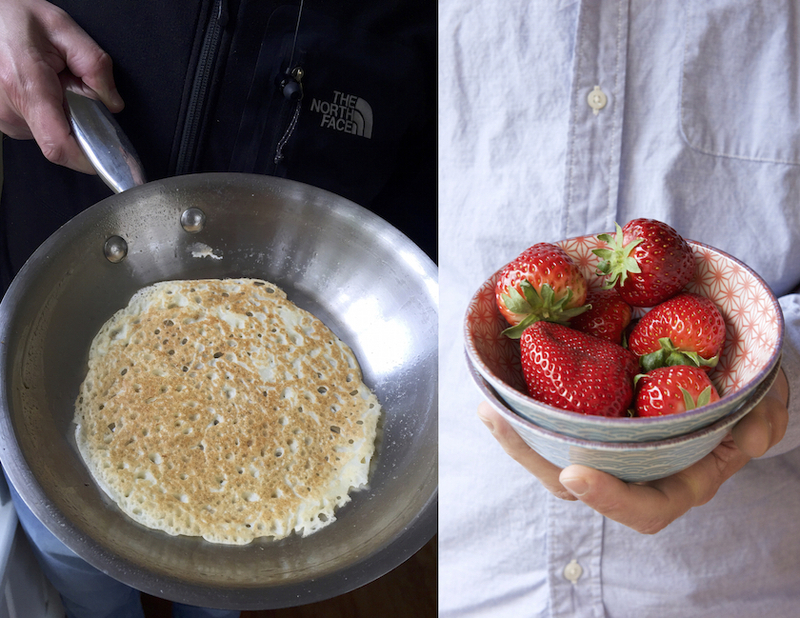 The stainless steel heated faster and created the same sizzle effect, with an eventual more lacy appearance to the pancake (see right photo above). 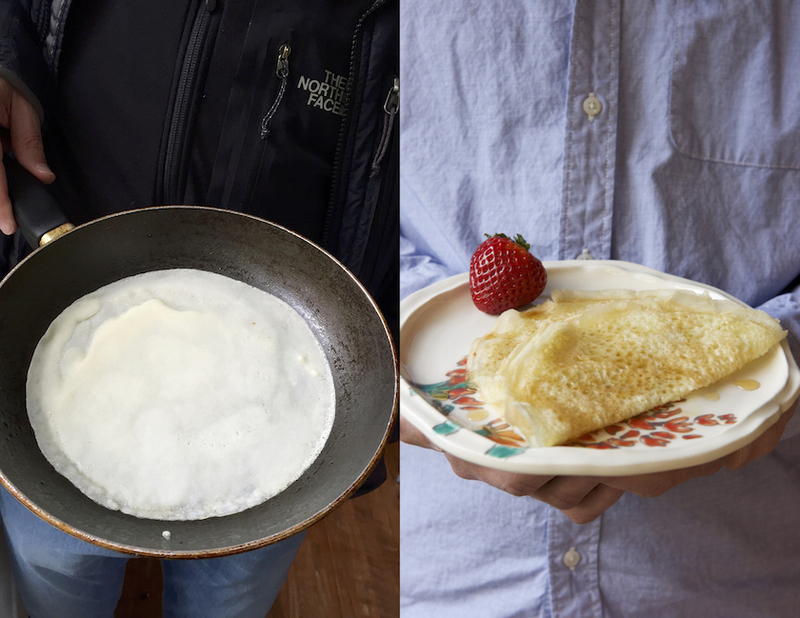 To achieve a more crepe like appearance and not a pancake in a stainless steel skillet, meant lowering the heat and being more in tune with the pancake, but is it really worth it?! I thought having two different looks to the same batter was cool and I could work quicker with two skillets on the stove. I don't recall over the years having issues achieving crepes in a stainless steel with all purpose flour. The non-stick, and purist amongst you please don't snub me for using it, does a beautiful job achieving that desired French-like crepe pattern and all. The non-stick doesn't heat up as fast as the stainless steel and the batter swirls in it beautifully. I put both skillets on low/medium heat. If I had to choose, the non-stick is my skillet of choice for perfect rice flour crepes. Although I tested the cast iron, I wouldn't recommend using it. It's too heavy to manipulate a swirl. Not to mention it has other limitations, one of which, I couldn't wipe off the touch of oil I poured in between pancakes with a paper towel. 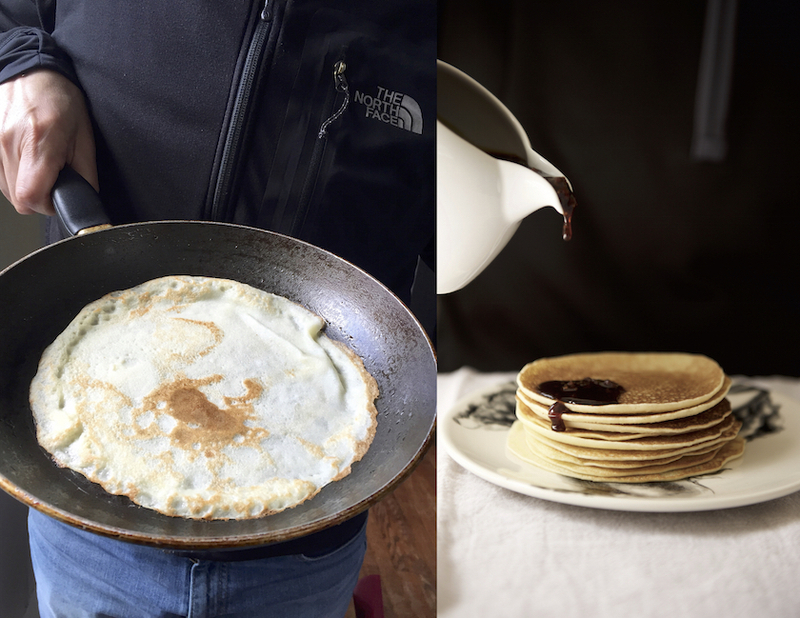 Some microscopic particles of the paper towel clung to the pores of the cast iron, and led eventually to black speckles showing up in the crepes. As a general rule, don't use paper towels to wipe off cast iron. Although these crepes are usually made with milk, I've seen coconut milk used as well. I deferred to the coconut milk, something about the super delicate flavor that comes through won me over. These pancakes are traditionally served with what's called shira, a thick Israeli date-syrup-like, called Silan as a sweetener. See my puck pancakes at the top for the shira/silan. I've also served these rice crepes with maple syrup. They were divine with this American twist. Sugar wasn't allowed on Passover in India, but here we can find Kosher-for-Passover sugar so I've added it to the batter. Speaking of restrictions most of the Ashkenazi (Eastern European) Jewish community doesn't eat rice and legumes on Passover while many Sephardi (descendants of Spain) Jews do. The Indian Jewish community, which is neither Ashkenazi nor Sephardi, eats rice and legumes on Passover . Whether you celebrate Passover or not, you'd want to include these rice flour crepes into your weekend rotation. Heat up a 10 inch skillet on low/medium heat. In a large bowl, whisk together all the ingredients for a few seconds until fully incorporated and smooth. Add a few drops of oil to the skillet. With a bunched up paper towel, swirl the oil to cover the entire skillet and wipe off excess oil. Ladle (1/4 cup) batter into the skillet and swirl it. You might need to fill in with a little extra batter if using a stainless steel skillet. Cover with a lid and let cook for 2-3 minutes. You might need to toss away the first pancakes. With a spatula, gently flip the crepe over in the skillet and cook covered with a lid for 30 seconds to a minute longer. Serve immediately with silan (date syrup) or maple syrup. They look delicious! Never tried making rice flour crepes. Must try soon. I love that you used coconut milk and it looks like you really perfected these crepes! These look so ethereal! I ave a feeling I would plow through them, mmm! These look great! I love that they're naturally gluten-free and dairy-free. I love that you made these with coconut milk! They are look perfect and I'm so happy they are gluten free because they would be perfect for my best friend gluten allergy! I am pretty sure they taste amazing with maple syrup too...that date-syrup-like sauce sounds amazing too. I love that you mastered a gluten-free version! YUMMATOLA... and that date-syrup sounds perfect.